The wedding is finally happening! Pictures, dresses, reservations, food, planning -oh, so much planning! 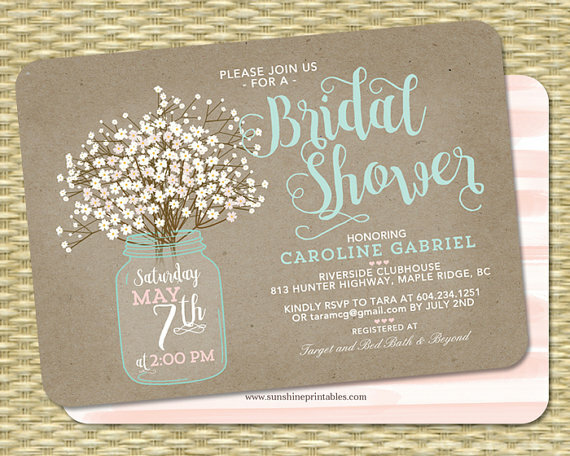 And you, lucky relative or friend, are totally stoked to be throwing a shower for the cute bride-to-be. Whether you intend to splurge a bit or a lot, I’m here to suggest a few ways of keeping things more reasonable on the monetary side of things. Here’s how to throw a bridal shower on a budget! Aw, c’mon. I know showers are great fun. You may even have a lot of time on your hands to plan and execute one. But, I’ve learned to never turn down help, unless it’s from my mother-in-law. You’re the one in charge, so you control how much help people contribute. Maybe you can pull a sister or two to tape up crêpe paper or sweep the floors. What if you want to run the whole thing? Go for it! Just keep the names of those who offered to help for when it’s the night before, and you realize you didn’t make rolls in time. Luckily for you, we live in the information age. If you were looking forward to only sending out virtual cards, however, you may have discovered that many people still prefer receiving a physical, mailed invitation. Face it -those people will probably bring the best presents, too. So, what are our options and how can we keep this bridal shower on a budget? Minted has many, many ideas of fairly inexpensive cards to buy, my favorite are these Four-Panel Invitations from Minted. Or, it lists quite a few you can rip off from if you’re talented in editing or design programs. I had to laugh when I heard that some people rent out venues for bridal showers, because I have never been to a shower like that. If you are interested in renting out a space, check out Rent My Wedding for special deals on rentable items for your wedding! Well, we did have an extremely informal one in the break room at work one time. If you’re looking for a nice location outside the home, many neighborhoods have churches or clubhouses that are cheap or free. Besides those, I am all for hosting at someone’s house. If your own isn’t up to your exacting standards, ask around. You’d be surprised who is willing to host, especially in the bride’s family (or, amongst her future husband’s relatives). You can save a lot of money for your bridal shower on a budget by having it somewhere for free! Here is another area I’ve never spent much on for showers, but maybe I have some money-savvy (lazy) relatives. The thing about food is: so long as you get good quality edibles, it’s really all about presentation. Take this fruit stand, for example. You could grab a ton of fruit at Costco, then spread it out over some lettuce you also bought at Costco. 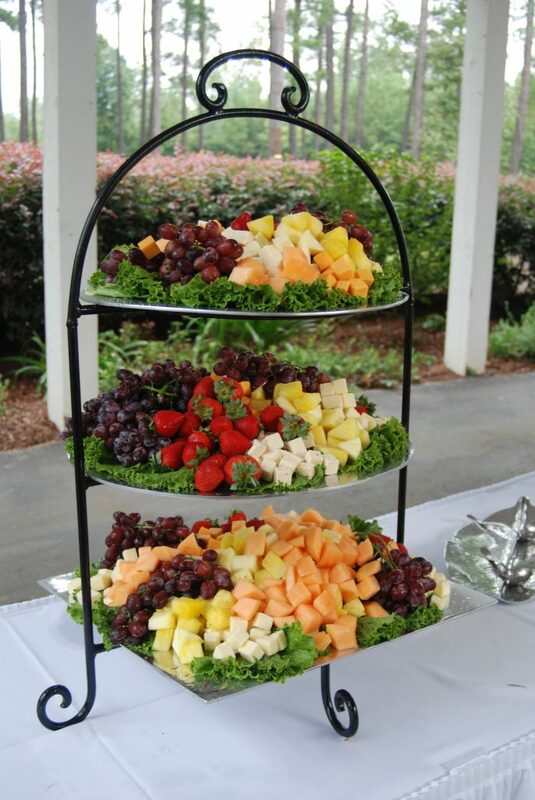 You’ve really got to find someone with the tiered stand for the full effect, but even a flat plate will look fancy with the greenery under the fruits. 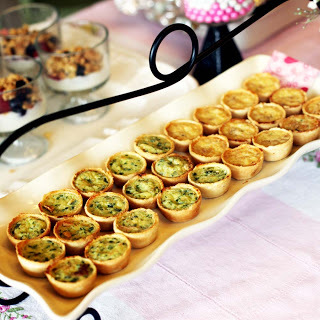 Or, if you’re looking for more advanced finger foods, try some mini quiche. They’re also at the store, by the way. I found some easy recipes online if you’ve got the time to make your own. I’ve also attended showers serving a simple chicken salad sandwich. The chicken salad is made with one of those whole, cooked chickens sold around dinner time, grapes, Mayonnaise, and slivered almonds. The rolls are usually from Costco, but those can be homemade by an eager relative. Obviously, this can get a bit pricey. But, it’s a shower -not an open bar wedding. 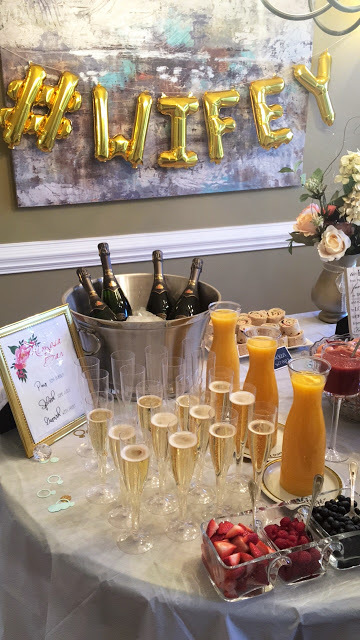 Therefore, Sweet & Savvy recommends going with a cute mimosa bar. She’s not alone, either. Do a quick internet search, and you’ll find everyone jumping on the mimosa wagon. For the layout pictured, set out different fruits and different orange juice flavors. Pour some champagne in fluted glasses, and let guests mix up their own. The cute, printable labels can be found at Lulu and Linen. Are you planning an event with guests staying the entire time? A drop-in, drop out? Open house? I like flexibility, and found three FREE games accordingly. 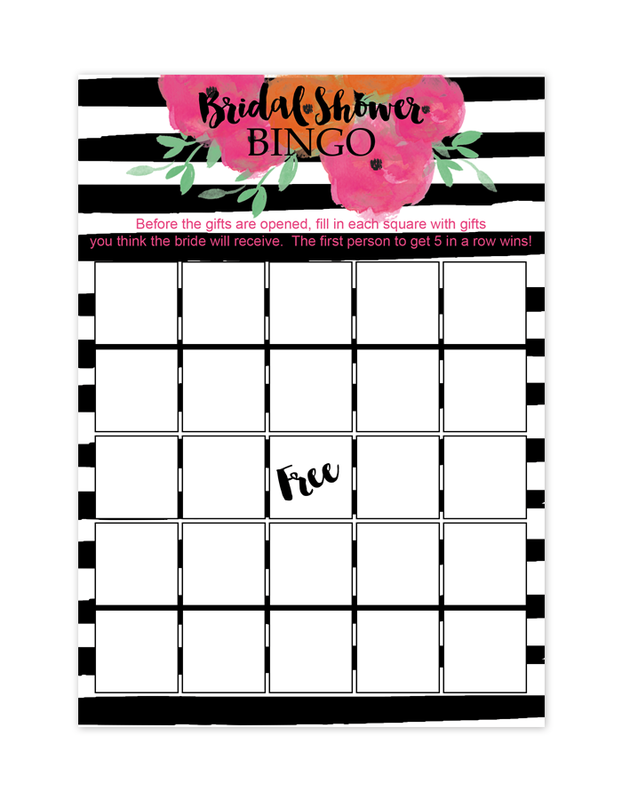 The first is Bridal Shower Bingo. Players write what they think the bride will receive as a present (lingerie, brownie mix, pillows, etc.). Once she opens her gifts, everyone marks off a space for those items. 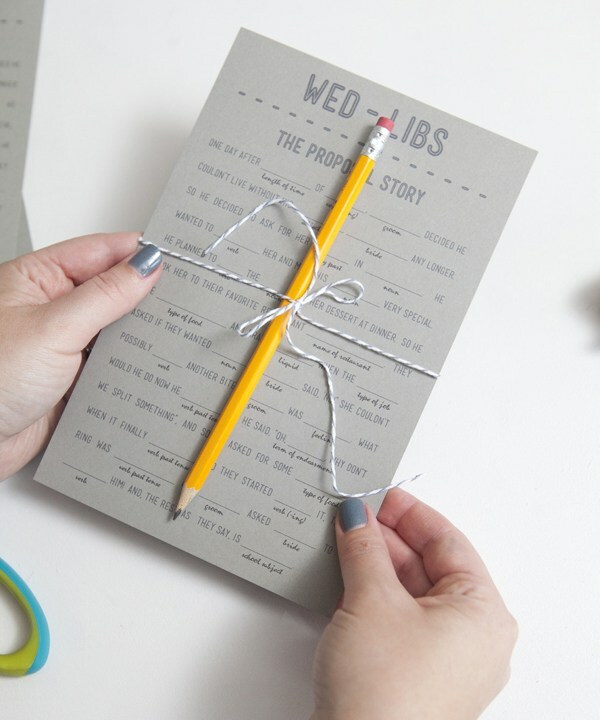 Type up how the bride met the groom, then take out a noun here, a verb there. Give everyone a pencil and read the results at the end. Other stories ideas include: The Perfect Honeymoon, or Their First Date. 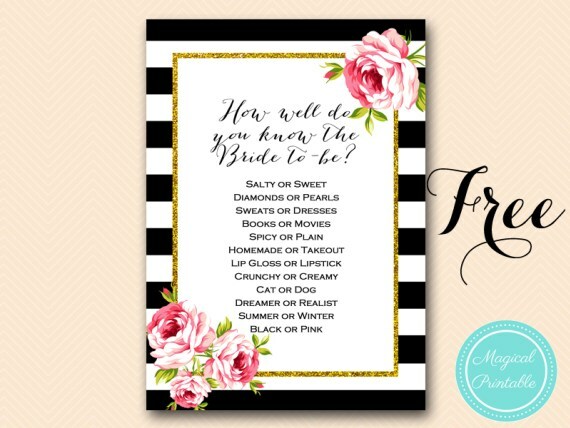 The last game is How Well Do You Know the Bride-To-Be? I’ve even got the free printable here. Guests simply circle an option. 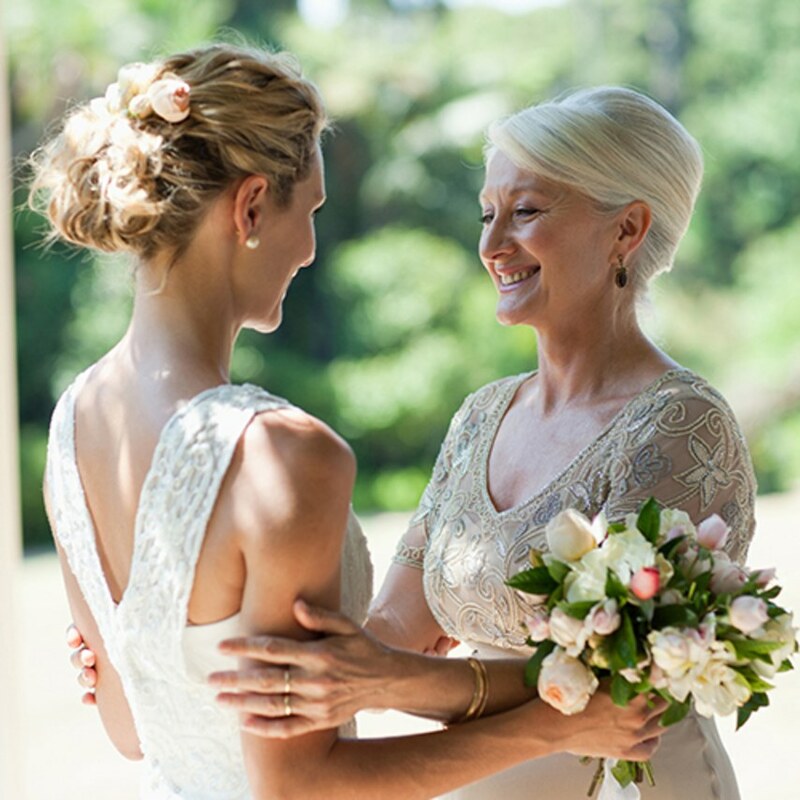 Be sure to have the bride fill one out, too, so you have the answers. 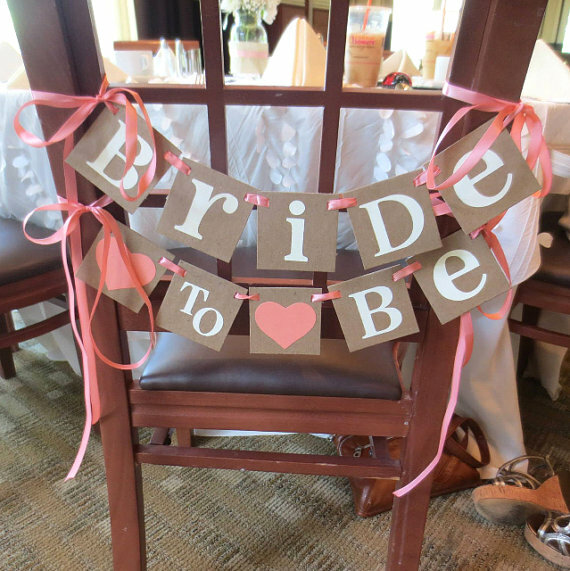 You’ve probably heard that it’s easy to decorate for a bridal shower on a budget. Then, you’ve looked at the results and thought those people probably should have splurged a little bit more than they did. We’re not those kind of decorators. It’s going to look cute. It’s going to at least look fancy. 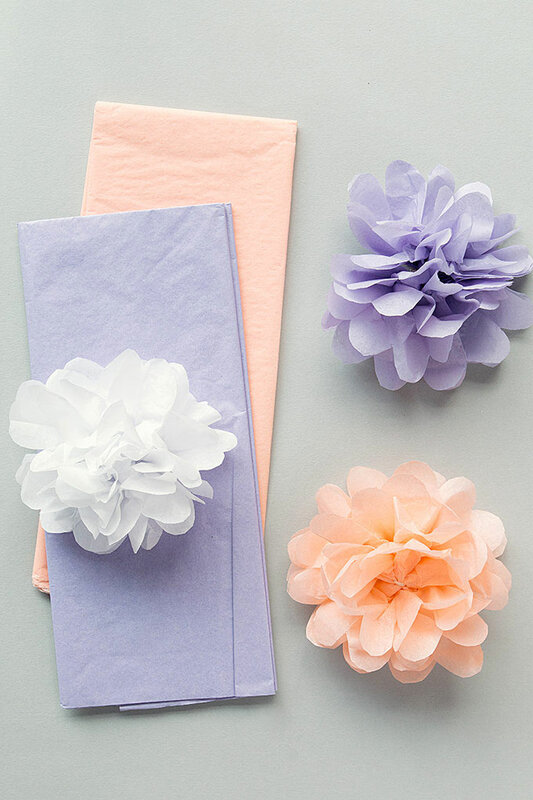 For starters, may I recommend the wonderfully versatile tissue paper flowers? I love them, because they are CHEAP, easy to make, and can be added as a nice accent to anything. Make a burlap banner; add a tissue flower. Lay out your food for the day; accent with tissue flowers. Need something extra with your balloons? Tissue flowers. How about a little different version of couples’ pictures? 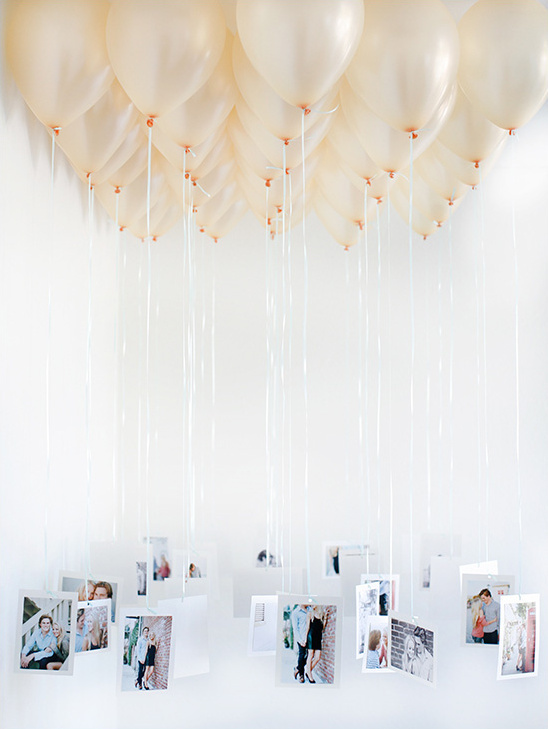 Would you think: balloon collage? I’m a fan of making the strings different lengths; besides that, I love the look of this original idea from Wedding Chicks. This is an easy, DIY thing you can do for your bridal shower on a budget. Did I mention cheap? 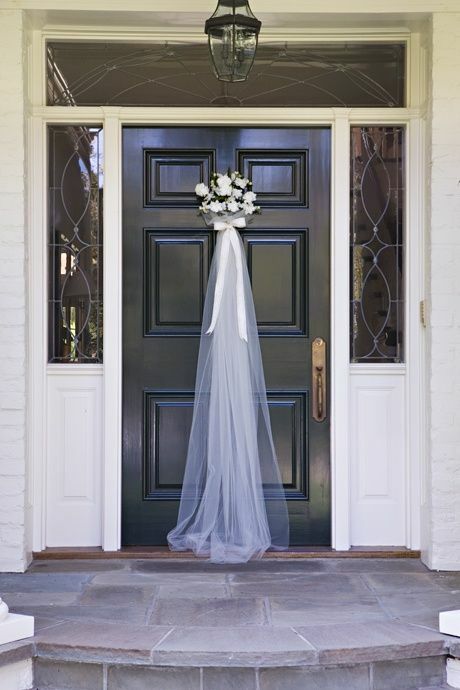 Speaking of banners like we did earlier, what about this simple one inspired by Weddbook? Thanks to the magic of vinyl lettering (or, stencils with paint), you can string up this cutie in a couple of hours. Or, spend a bit extra and buy it all made. You can hang it from the main star’s chair, from a mantel, or the wall. Andee Layne froze flowers into ice. What an elegant, unique way to serve those drinks you’re going to have with your fruit bar. 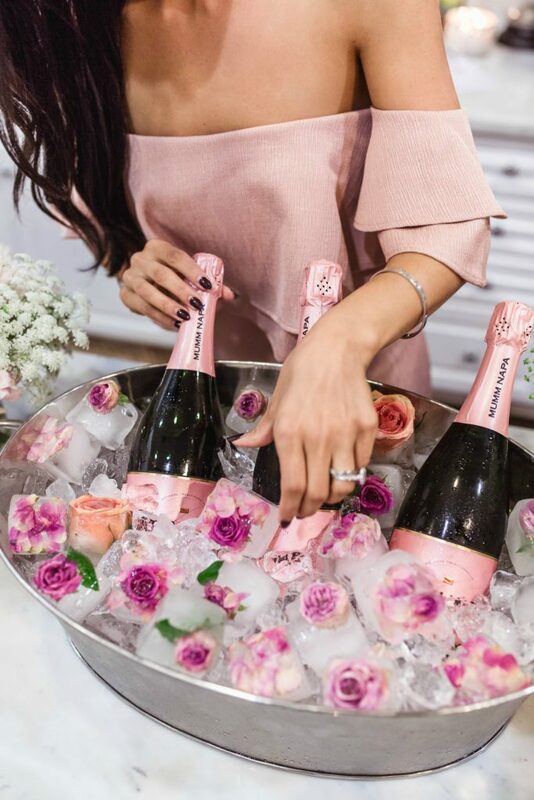 This is the perfect addition to your bridal shower on a budget, and it stays within a reasonable monetary value. You’re set! Go host your bridal shower, and wow them all!